Are you looking for holiday apartments for your journey in Milan? 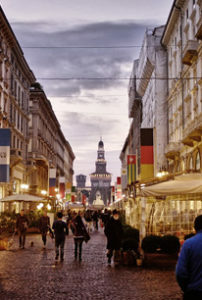 HomeLovers is a constantly growing company, with a specialization in finding holiday accommodations in Milan for anyone wishing to spend a limited time in the city. With the purpose of providing short term apartment rentals, the website provide to put customers in touch with the owners of apartments who have a need for renting their properties for reduced and short-term periods. On the portal are featured apartments made up by one or more rooms, distributed in many areas of Milan. The accommodations have in common that tey are fully furnished and located in strategic, central, safe areas which are also well-supplied by public transport and various shops. The choice of holiday apartments in Milan will become immediate and simple, providing the time preference and the area of the city where you would like to stay. Thanks to a convenient virtual catalog, it will be possible to see all the available apartments, accompanied by illustrative photos, features and prices. Studios, bi-roomed, three-roomed flats and many other housing solutions, are assigned each day to the clients who want a comfortable and welcoming accomodation, or to those who prefer the warmth of a home rather than the anonymous and sterile room of an hotel. The main occupation of HomeLovers’s competent staff is the assignment of vacation rentals in Milan. They are also available for providing further details to those who are the least experienced, helping them with orienting themselves in the city’s thick real estate network and driving quickliy each buyer to the home which is the most suitable for its needs.